The style and substance of Narendra Modi’s foreign policies have been very different from those of his predecessors. The turn of the year and the middle of Narendra Modi’s first year as prime minister is an opportunity to compare the style and substance of the foreign policies of his government with those of the previous dispensation. The contrast is most apparent in the energy and attention that has been invested in international relations, rather than in the direction. After all, while core national interests—such as border security and development—endure, the manner of pursuing them can indeed change. Modi’s articulation of his vision of the country has included new elements like the “Make in India” campaign; he has also brought a greater speed and intensity to the pursuit of foreign policy objectives such as attracting foreign direct investment to promote manufacturing in India. In pursuing the goal of industrialization, Modi has shed some of the ideological elements of “third-worldism” and non-alignment, which were the signature of the previous government. His government’s decisive foreign engagements have already changed international perceptions. The change is most visible in India’s relationships with the U.S. and Pakistan, though the outcome of his proactive engagement with China remains ambiguous. The differences between Modi’s and the previous governments approaches to these three critical bilateral equations are discussed in the following sections. 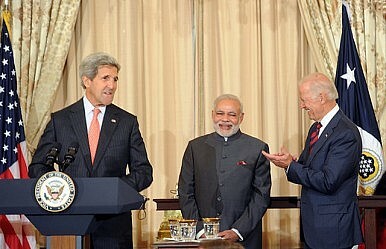 Although it was the UPA government that signed the India-U.S. nuclear agreement in July 2005, it remained passive about implementing the deal. The new government has so far not been able to move ahead on amending the nuclear liability legislation, but it has been outspoken about the importance of a good relationship with the U.S.
Modi has proactively intensified interactions—the best proof of which is U.S. President Barack Obama’s acceptance of the invitation to be the chief guest at the Republic Day parade in New Delhi in 2015, which will make it an unprecedented second visit to India by a serving U.S. president. The importance explicitly placed by this government on India-U.S. ties stems from several factors such as India’s need for U.S. investment and access to its technology. Good relations with the U.S. also usually translate into good relations with its allies such as Australia, Japan, and Western European countries, which in turn bring strategic support and increased investments from all these countries. Washington’s capacity to influence Islamabad is another critical factor in the India-U.S. relationship. Additionally, in India’s experience, good relations with the U.S. tend to relieve pressure from China. Previous risk-averse governments were oversensitive about Chinese reactions to India’s positions on the border issue. In a clear departure, the Modi government has overtly reached out to China. The first foreign leader that Modi received was Chinese Foreign Minister Wang Yi. In turn, China has responded positively, as was evident in the warmth during President Xi Jinping’s India visit in September, and his calls for a solution to the contentious border issue. Although Modi’s admiration for China’s economic growth was noticeable during the meeting with Xi, the outcome of this diplomacy with China is still ambiguous. This is because Beijing has combined offers of investment in India’s infrastructure with consistent probing on the northern border; and it continues to pressure members of SAARC to promote Chinese membership to reduce India’s influence in the grouping. Modi took the initiative on Pakistan by inviting Prime Minister Nawaz Sharif (and other South Asian leaders) to his swearing-in ceremony in May 2014, and later by calling off high-level talks when Pakistan high commissioner Abdul Basit’s meeting with separatists clearly disregarded a démarche from the Indian Ministry of External Affairs. Modi has also implemented a policy of strong military retaliation—rather than mere condemnation and exhortation—to provocative acts on the border, and he virtually isolated a domestically diminished Pakistan at the recent SAARC Summit. In contrast, the previous government sought to maintain a dialogue with Islamabad—often under pressure from Washington—even during times of strained bilateral relations. Modi’s efforts will be vindicated if investments begin to flow into India in 2015. That will depend as much on diplomacy as on internal reform, on whether industrial production can pick up, and on oil prices—which together determine India’s fiscal deficit, levels of inflation, and other economic indices. In the past, Indian governments have all stated that alleviating poverty is a major policy objective—for which conducive international equations and a peaceful neighbourhood are necessary conditions. Modi has tried to bridge domestic and foreign policy by pushing for economic growth through industrialisation that involves FDI and foreign manufacturing in India. These, in turn, can address poverty. After a busy international itinerary in 2014, Modi’s foreign policy will now be better executed by focusing on legislating reforms at home, such as the Goods and Services Tax and banking sector reforms, in order to propel the Indian economy towards higher growth. Neelam Deo is Co-founder and Director of Gateway House. She has been the Indian Ambassador to Denmark and Ivory Coast with concurrent accreditation to several West African countries. This article was originally published at Gateway House: Indian Council on Global Relations, a foreign policy think tank in Mumbai, India, established to engage India’s leading corporations and individuals in debate and scholarship on India’s foreign policy and the nation’s role in global affairs. Video: Sadanand Dhume on Modi's foreign policy goals and India's relationships with China, Russia, and the U.S.